Cut each thigh into 3 strips and place in a bowl. Sprinkle with the garlic and the Baharat. Mix well and leave to marinate in the fridge for at least 1 hour (up to 6 hours). 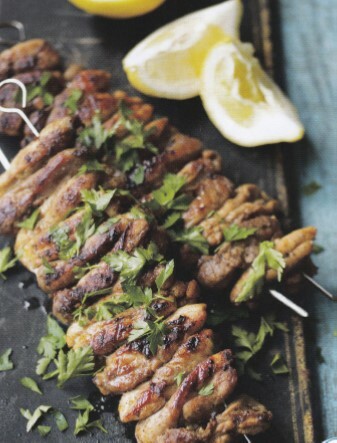 Using two metal skewers about 5cm (2in) apart, thread half the meat onto the skewers. Repeat with an extra two skewers and the remaining meat. Make sure the meat in packed quite tightly. Heat the oven to 220oC (gas mark 7). Roast until golden and cooked (about 25-30 minutes). Rest for 5 minutes then sprinkle with coriander and serve with yoghurt and lemon wedges and the cooking juices.